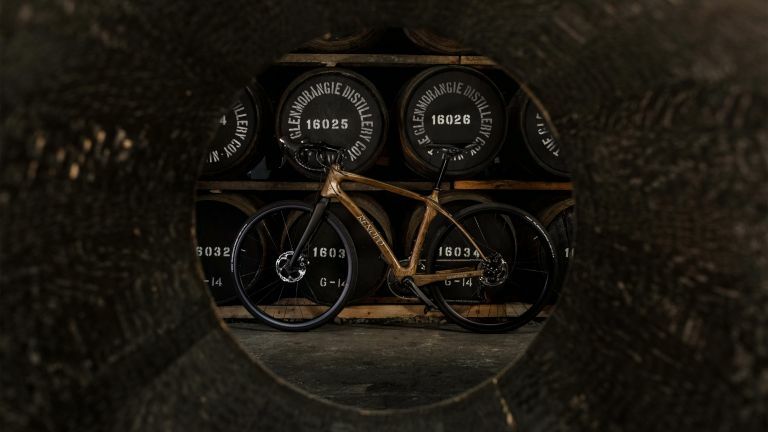 Renovo has teamed up with Scottish whisky distillery Glenmorangie to create a beautiful limited edition wooden bike. It's called The Original, and we think we're in love. If you're not a whisky connoisseur, Glenmorangie are know for having the tallest stills in Scotland, this allows only the lightest vapours to reach the top, and creates a purer, smoother spirit. This spirit then spends a decade in high-quality American oak ex-bourbon casks, as it matures into Glenmorangie’s flagship 'expression', The Original. While some distilleries use casks up to five or six times, the casks of The Original are used only twice to ensure they always remain full of flavour. When Glenmorangie is finished with the casks, their staves are shipped from Scotland to Renovo’s workshop in Oregon, in the U.S. Here, the expert bicycle makers craft them into the Glenmorangie Original bikes. Each bicycle contains about 15 staves in a frame which reflects the curvature of the casks, making them truly unique. Dr Bill Lumsden, Glenmorangie’s Director of Distilling & Whisky Creation, said, “Glenmorangie is renowned for using the finest casks just twice, to create the smoother, rounder profile of The Original – a whisky which beautifully balances hints of ripening peaches and citrus fruits with creamy, vanilla notes, to delight malt connoisseurs and amateurs alike. The frames can vary in size to accommodate different riders (from 52-61cm) and weigh around 8.1kg, each taking 20 hours to hand make. The Glenmorangie Original Bicycle costs $6,950 (around £5250).